Hey Roy, I've been playing with this synth (I actually started looking for a semi-modular effects box, and started using this instead, then started using it as a synth, too!). It's a nice piece of work! -an insert module, so any device can be inserted. Maybe it's a limit of presets not to load/unload devices, but it'd be cool. So an external effect port maybe also be good! A sequence type Mod. Difficult to place in the size provided, but an external surface could also work for editing steps. and maybe a few extra inputs. I've been using my bass through an envelope follower, and then into the Synthi to be used as a mod source on an insert. also, an X-Y or 4-input joystick mixer for the SourceMix1/2 would also add some power like the vectron has! in fact I thought of exactly the same things you mentioned (insert, sequencer, xy control) when I made Synthi. back then I didn't like the fx insert idea because you can't modulate fx inserts, and the core feature of Synthi is its modularity - every module should be able to be modulated by any other module. for the sequencer(s), problems would have occurred with a) space, as you mentioned, and b) dsp usage, resp. time to load the device. together with the difficulty whether to choose gate, control, note, or all of them. 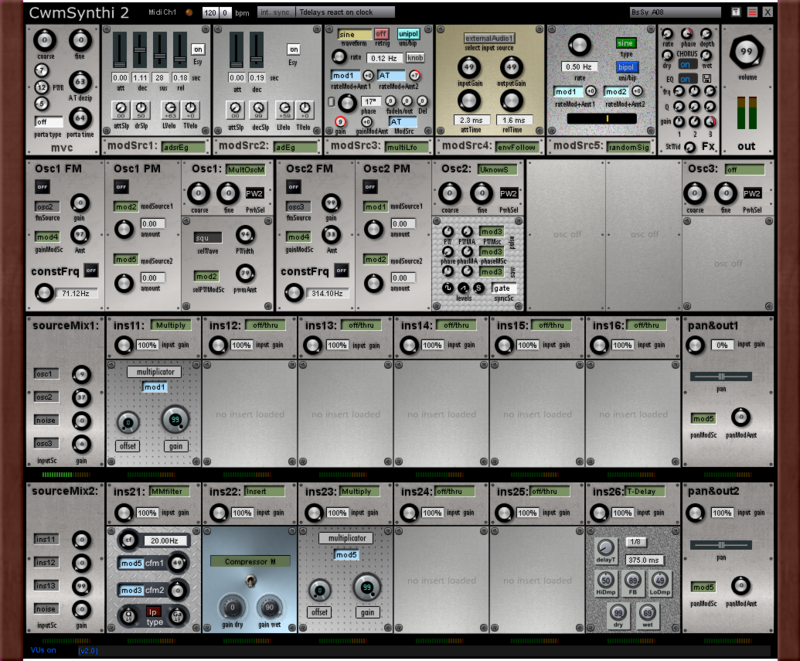 it is possible to have as many ins and outs for insert fx as you like! simplest device but can be loaded as an insertFx and be modulated, by choosing two mod sources for cf and q. (note: to deselect a mod source, choose same mod source again, and its gone). so, for a future version of Synthi, I could outsource dsp-hungry modSources -like sequencers- to external devices (eg Modular). I recently tinkered again with ol' CwmSynthi. Excellent ! Roy, you are one of the guy who makes Scope so unique ! Thanks ! Damn ! I forgot to wish you a merry christmas ! Don't worry for dsps, I can't make any test right now. Tons of gift ! Ah ah ! For you too ! sorry I forgot to delete some presets made with development versions of cwmSynthi2. they are located in the 'ExternalSignal' folder - please don't use them / delete them as some errors will show up. yay! Thanks Roy. I've been checking your web page every day since I saw this. Now I can try it out. Incredible Roy, Thank you. Such an excellent device. Merry Christmas and good luck changing your mobo! Roy! I finally made it thru all of your presets on the Synthi2. Love those pads! Very nice improvements over the last version, which I also like a lot. Having a little bit of stability issues when I up the poly on the bigger presets but that's the 64bit and SAT crud most likely. I will be having fun experimenting with this one for a long time. What a Monster of a synth .... !